Dan Dean is a truly multitalented artist. Dan has achieved national and international recognition as a Bassist, Producer, Composer, and as an audio and recording Engineer. Dan has performed with the some of the finest musicians and musical organizations of our time, including: Shelly Manne, Howard Roberts, The Great Guitars (Herb Ellis, Charlie Byrd, Barney Kessell), Eddie "Cleanhead" Vinson, B.B. King, Eddie Harris, Blue Mitchell and Harold Land, Buddy DeFranco, Donny Hathaway, Tom Scott, Dave Grusin, Don Grusin, Ernestine Anderson, Bill (William O.) Smith, Ernie Watts, the Seattle Symphony, Walt Wagner, Seattle Opera, Freddie Hubbard, Bill Mays, Della Reese, Emil Richards/Joe Porcaro and many others. 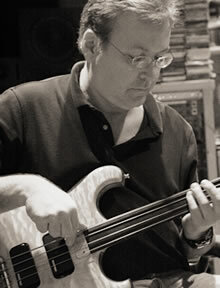 Dan has received numerous broadcast and film awards including the Cannes Golden Lion, Addy Awards, Telly Awards, Best of the West Awards, Clio Awards, IBA Awards, IBA "Spike" Award, NEA Composition Award recipient in Jazz Composition, One Show Silver Pencil, a Seattle Symphony Orchestra commission to compose "Piece for Electric Bass and Vibraphone", National Jazz Educators Award of Excellence, Rosie Awards and others. The Dan Dean Sample Libraries have thus far won 3 Keyboard Magazine’s “Key Buy” awards, Electronic Musician Magazine’s “Best Buy”, and over the past year an a half have earned a total of 35 stars in Sound On Sound Magazine. Dan has been a major contributor to music education. He is the author of the widely successful Hal Leonard Series for Electric Bass Method Books 1, 2 and 3, Hal Leonard Electric Bass Studio Series Books 1, 2 and 3, Bass Trax and other related projects. He has been a member of the teaching faculties in Jazz studies and Electric Bass, of Western Washington University, Olympic College and Shoreline College. Dan received his B.A. in 1975 from the University of Washington where he majored in English Composition and Literature. He is also an FAA rated commercial pilot. Dan is also a member of several professional organizations. He is a member of ASCAP (as a Writer and Publisher), the Society of Composers and Lyricists, AES (Audio Engineering Society) and an AFM member.